This morning over at Kirkus, I write about Polly Horvath’s new novel, Mr. and Mrs. Bunny — Detectives Extraordinaire! Who else has read this very funny book? Raise your hand, please. And come talk to me about it. 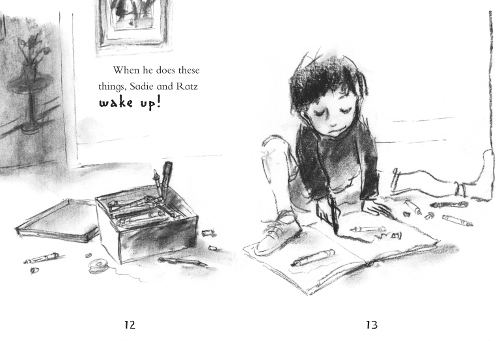 And Ann James’ charcoal drawings for the book? Well, as I wrote last week, they are striking—you can see for yourself with the images I’m sharing today—and they perfectly capture the emotional impulses of Hartnett’s story. They are reminiscent to me of early Sendak art, which is fitting for what I find to be a very Sendakian tale. SADIE AND RATZ. Text copyright © 2008 by Sonya Hartnett. 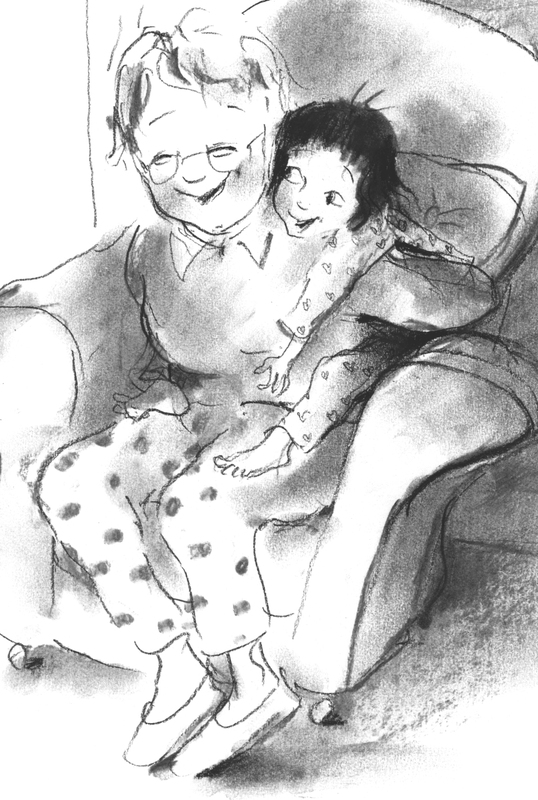 Illustrations copyright © 2008 by Ann James. Reproduced by permission of the publisher, Candlewick Press, Somerville, MA on behalf of Walker Books, London. Waving my hand high in the air–read and reviewed Mr. and Mrs. Bunny–Detectives Extraordinaire on my blog. I loved this title and am hopeful that this is the first of many in a series. I remain in love with the idea that she names her hands, and that sometimes, they are asleep and just hands… the shadows and smudgy charcoal give this book so much of a textured darkness – even without having read the whole thing, I’m intrigued. Love the immediacy of the charcoal. And the smudgy shadows here and there give so much depth with so little. Jess: YES. Immediacy. Smudges. THE LINES. Oh, the lines! I love these illustrations. I loved almost everything about Mr. & Mrs. Bunny, particularly the idea that you can find out where The Marmot lives moment-to-moment by Googling him (kind of like how I wish Google really worked, only instead of marmots, I’d like to find my car keys). Only one clanging note in an otherwise beautifully composed book – about halfway through, she makes the jarring and character-inconsistent choice to have Madeline describe her family vacation as having been “mad gay.” It pulled me right out of the story, didn’t make any sense given her crunchy hippie upbringing, and besides which, the sentiment isn’t even backed up by anything Madeline says before or after. I wish that hadn’t gotten by in editing. :-/ Otherwise perfect. Kate, I’d forgotten about that part! I also found that toward the end of the book, the parents speak more in “like”s than they ever did in the beginning. (Does that make sense?) Their hippie-ness was accentuated more at the end and was slightly jarring. I’m just now remembering those things. 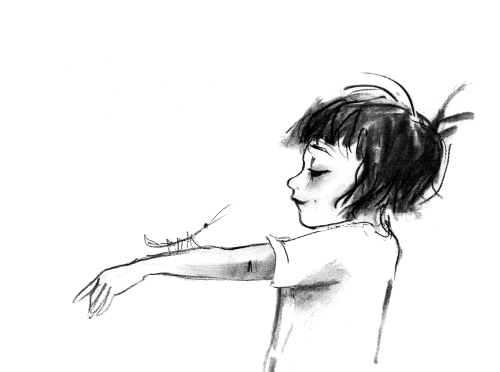 Lovely illustrations, and the first line about the stick insect–that sold it for me! Oh, I have to have this one! Love, love, love the illustrations. I can still feel those sticky little legs crawling up my arm. Thanks for reminding me!